Here are the Spelling Bee Study Words for this year’s Spelling Bee taking place on November 19 at Martins Creek School, 9 a.m. The Cherokee County Schools’ Spelling Bee will focus on the Study Words and Challenge Words, but also may include words from the Merriam Webster Dictionary. Here are the Spelling Bee Challenge Words for the 2014-2015 Spelling Bee taking place on November 20, 2014 at Martins Creek School. Study these after you have mastered the Spelling Bee Study Words (See separate list of Spelling Bee Study Words 2014-2015). Here are the Spelling Bee Study Words for this year’s Spelling Bee taking place on November 20 at Martins Creek School. Friends of Murphy Library are holding their popular annual Arts & Crafts & Craft Supplies Sale this Thursday and Friday, June 19 and 20, from 9 a.m. to 2 p.m. There will also be a Books in the Breezeway Sale in the back of the library. Friends and local crafters are raising funds for prizes in the Cherokee County Middle Schools Spelling Bee, co-sponsored by The Cherokee Scout’s Newspaper in Education Program. Crafters include Sammie Simpson, Jo-Ann Allen, Sharon Francis, Renata Craig, Margie King, Vivian Schell, Jan Ruiz, and Hollie Criswell. Finished crafts are for sale along with quilt tops, sewing machines, fabric, beautiful yarns, flowers, baskets, jewelry items, and paper-crafting materials. Look around, you will find something fun! Call 837-2417 for more information, or better yet, just stop by. 12:00 Sharon Francis will demo the Envelope Punch Board, a Stampin’ Up! tool that create 66 different size envelopes and boxes too! Measurements are listed on the board. Come see how easy it is to make an envelope. 12:30 Edie Hantula will get you started in the wonderful art of woodcarving, a traditional Appalachian craft. 1:00 p.m. Sharon Francis introduces Project Life by Stampin’ Up! to help create quick stunning scrapbook pages that coordinate in colors and sizes to the Project Life page protectors. You have to see this! 1:30 p.m. Sammie Simpson will show you the proper “Care and Feeding of Vintage Sewing Machine.” Bring her your questions – she’s got the answers. 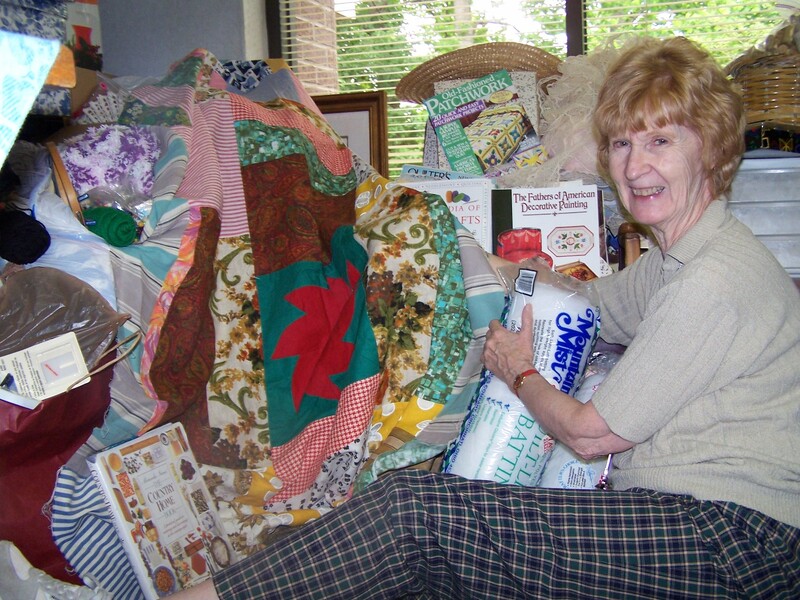 Friends’ volunteer Linda Perry previews crafts and supplies donated for sale at Murphy Library June 19 and 20. The Cherokee County Schools Spelling Bee took place at Martins Creek School on October 17 and all fifteen students at the Bee were amenable to spelling the words they were given. However Martins Creek 6th grade student Pressley Payne actually had to spell “a-m-e-n-a-b-l-e.” He did it calmly, distinctly, and perfectly, winning the 1st Place trophy along with a one hundred dollar cash prize. The two competent runners-up were 7th graders, Eric Fox, from Hiwassee Dam Middle School in 2nd Place and Marie Sawdy from Murphy Middle School in 3rd Place, winning trophies along with fifty dollar and twenty-five dollar cash prizes respectively. In addition to Pressley Payne, Hannah Smith and Eris Davis represented Martins Creek. Hiwassee Dam students Nina Nicholson and Tucker Lynn joined Eric Fox, and Hagan Newton and Aleayah Cox came from Murphy Middle School along with Marie Sawdy. Andrews Middle School students included Magnus Fonda, Joshua Um and Karra Postell. Kirsten Pickelsimer, Shawn Bruce and Kaylee Campbell represented Ranger Middle School. 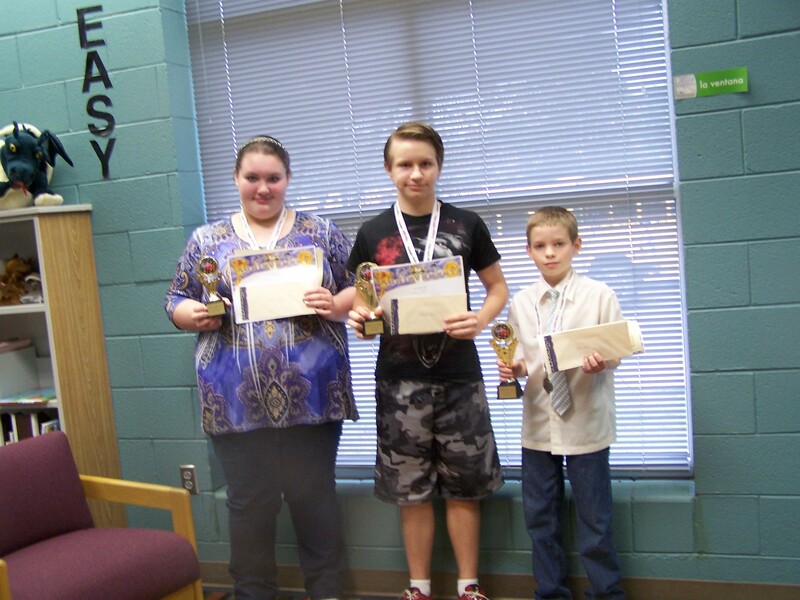 Marie Sawdy, 3rd Place, Eric Fox, 2nd Place, and Pressley Payne, 1st Place winners at Cherokee County Schools 2013 Spelling Bee. Parents cheered, teachers and principals smiled, and the hard-working students simultaneously breathed a sigh of relief. Many thanks to all the crafts people and Friends volunteers who helped raise funds for prizes. Don’t miss this! Crafts, Craft Supplies and Book Sale at Murphy Library this Thursday and Friday, 9 a.m. to 2 p.m. If you are an artist, craftsperson, book lover, collector, or just looking for a good time, don’t miss Friends of Murphy Library’s popular Crafts and Craft Supplies and Books in the Breezeway Sales on Thursday and Friday, August 2 and 3, from 9 a.m. to 2 p.m. at the library. 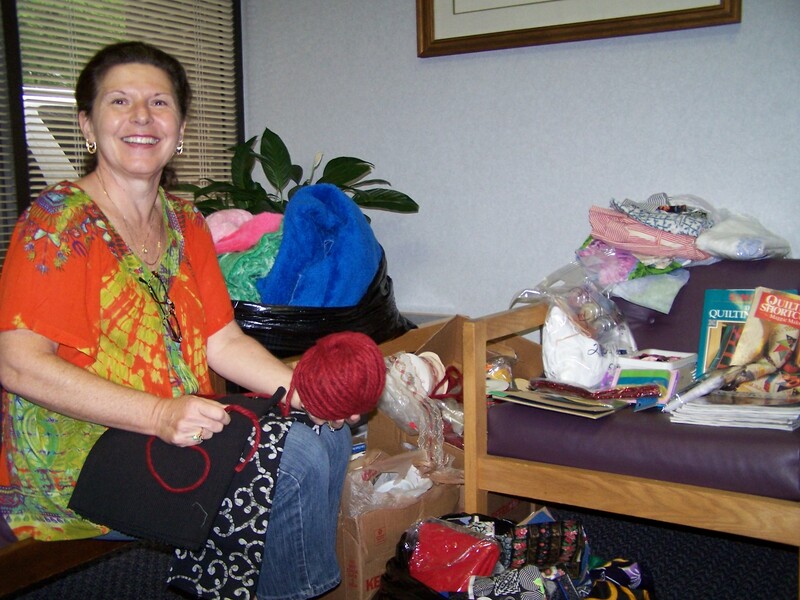 Murphy Library volunteer Julie Armstrong looks over items for Friends of Murphy Library’s Crafts and Craft Supplies Sale this Thursday and Friday August 2 and 3 in the library’s meeting room from 9 a.m. to 2 p.m. The Books and Media Sale takes place in the breezeway in back of the library. Call 837-2417. The Crafts and Craft Supplies Sale raises money for prizes in the Cherokee County Schools annual Spelling Bee. The Bee is co-sponsored by The Cherokee Scout’s Newspaper in Education and Friends of Murphy Library. Crafters and artists sell their excess supplies, finished crafts and make a donation to the Bee fund. They love to talk about their work. Sammie Simpson, Jo-Ann Allen, Sharon Francis, Kathy Hoyt and Leslie Beaster will have tables full of quilts, quilting fabrics, yarn, scrapbook items, sewing items and lots more. The Friends sell donated items including a whittling set, tie-dye paints with t-shirts, fabrics, and frames. Moreover, Friends members like Louise MacDonald are there to lend advice to novice crafters. Are your bookshelves empty? The Murphy Library’s Books in the Breezeway shelves have been reorganized making it easy to find your favorite authors, fiction and nonfiction, and lots of books on tape. And when you buy books on tape, they leave your hands free for, what else, your favorite craft. Call 837-2417 for details.